Embark on a globetrotting expedition around the world to discover the Age of Reptiles! Dublin’s Ambassador Theatre presents Dinosaurs Around the World. Now open daily from 10:00am with last entry at 6pm until 30 April 2018. Dinosaurs Around the World takes you back in time on a dinosaur adventure and a tour of an Earth very different from today – a time before the continents as we know them existed, when lush landscapes covered Africa and greenery was the norm in Antarctica! With advanced animatronics, a multi-layered narrative, fossils, authentic casts, cutting-edge research and immersive design elements you’ll experience the Age of Reptiles as it comes to life! Dinosaurs Around the World invites you to grab your prehistoric passport to Pangea and discover how plate tectonics, land bridges, and volcanic activity allowed dinosaurs to disperse to all corners of the globe, giving each of the seven continents its own unique selection of these giant reptiles. During their 172 million year reign, dinosaurs adapted into a variety of forms due to the conditions of the areas in which they lived. 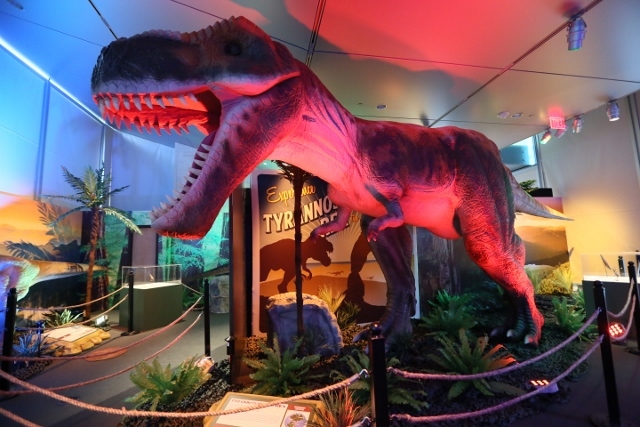 The exhibition includes examples such as the mighty T. rex of North America, the swift Velociraptor of the Gobi Desert, the massive herbivore Amargasaurus form the tropical jungles of South America and ten others! In addition to advanced animatronics, Dinosaurs Around the World also features information about the geologic time scale, geology, geography, and climatology. The exhibition poses questions to the visitor about the reign of the dinosaurs and helps them to discover how dinosaurs lived on each continent, how they interacted with each other, how geography impacted their behavior and diets, and what the continents were really like at the time. Dr. Gregory M. Erickson, a world-renowned dinosaur paleontologist, is the Senior Scientific Advisor for Dinosaurs Around the World. Dr. Erickson received his Bachelor of Science degree from the University of Washington, a Master’s degree from Montana State University, and a Ph. D. in Integrative Biology from the University of California, Berkeley and conducted post-doctoral research at Stanford University and Brown University before joining the faculty at Florida State University in Tallahassee. Dr. Erickson is currently the curator for the Florida State University Museum and holds research appointments with the American Museum of Natural History in New York, The Field Museum in Chicago, and University of Alaska’s Museum of the North in Fairbanks. Dr. Erickson is working with Imagine Exhibitions as an advisor, writer, and editor of the paleontology copy for the Company’s Dinosaurs Around the World exhibition. Dinosaurs Around the World is open daily to the public from 10 a.m. with last entry at 6pm for a limited time only. Tickets available from Ticketmaster outlets nationwide and from the Ambassador Theatre Box Office. Imagine Exhibitions is currently producing over 35 unique exhibitions in museums, science centers, aquariums, integrated resorts, and non-traditional venues worldwide. In addition to developing successful traveling exhibitions, Imagine Exhibitions designs, opens, and operates permanent installations and venues, and consults on building, expanding, and directing museums and attractions. With over 25 years of diverse experience in the museum and entertainment industries, Imagine Exhibitions consistently develops exhibitions that educate and excite while exceeding attendance goals. For more information, visit www.ImagineExhibitions.com or find us on Facebook.